Kalafina sang their hearts, and lungs, out. They were breathless as the show drew to a close, as even energetic Keiko said between gasps of air, “Now—we have—one last song,” and it’s no wonder: with forceful songs like “Sprinter” and “Kyrie” on the set, and difficult close harmonies to match alongside choreographed dance moves, even an hour-long set would be exhausting. Fortunately, the singing didn’t suffer much, despite a few bum notes here and there, only apparent if one is familiar with the studio recordings as I am. And if anything, to me they contributed to the “live” feel of the show, which otherwise (given the use of backing tracks rather than a band) would have sounded like note-for-note reproductions of the album. It’s the old rocker in me talking, I guess; while Kalafina is anything but a rock band, I like having an element of humanness in a live concert. I know others will disagree, but the mistakes didn’t spoil things for me. The appearance of Kalafina almost certainly has to do with the explosion of Madoka Magica, and from every indication in both the panel and the concert—that show is going to be a blockbuster. For a show of only a few months’ age, it had incredible name recognition in the convention as well as cosplayers. Virtually every person in the packed fan panel recognized “Magia” as that show’s ending song. They cheered loudest as they performed that song tonight, only rivaled by the cheers for “Oblivious,” the first Kyoukai ending and their very first single. Aniplex/Bandai has nothing to worry about, I think; Madoka is going to sell gangbusters. And Kalafina were a frontline vehicle for that dark, made-for-Kajiura production. Speaking of Kajiura—I sat in the press balcony with a few other reporters/bloggers. One of them wondered just who a mysterious Japanese woman with a broad-brimmed hat was, sitting in the row in front of us with other Japanese reporters, in a VIP spot…could it be Kajiura-san herself, watching her proteges perform for the first time in the West Coast? We never knew; she slipped out before the show’s conclusion. But I bet if it was her, she would have been happy. The Madoka wave that her music and her group are riding didn’t seem anywhere near cresting if this show was any indication. If anything, it seemed like it was only the beginning. 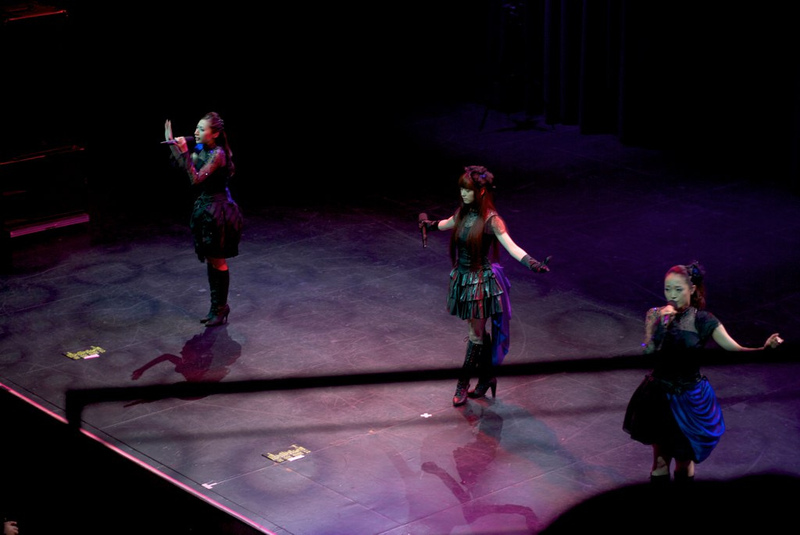 Previous PostHatsune Miku Concert: Videos and OverviewNext PostAnime Expo 2011 – Cosplay Extravaganza!! Sure wish I had a chance to go see them. Their live performance must have been amazing. It was most likely the lady herself – why else would she slip away so mysteriously? 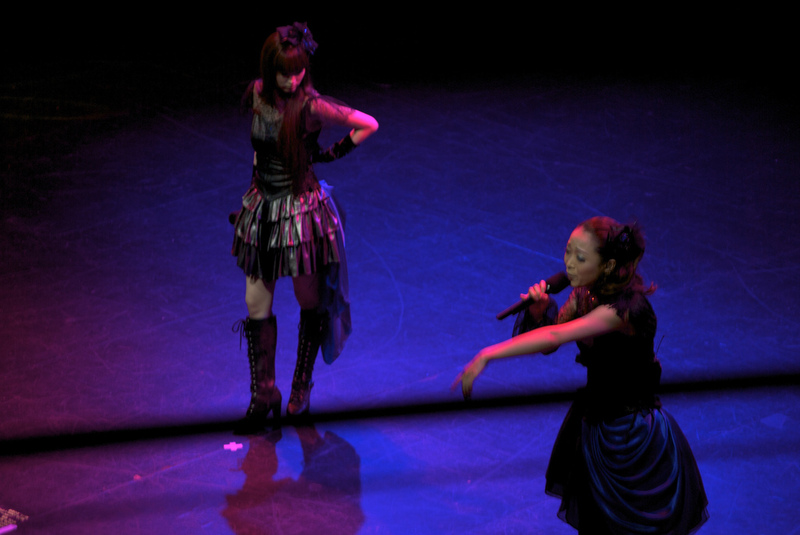 Anyways, I admire Kalafina since they all have such strong, commanding voices. They’re great. What a concert this would have been to see. ^_^ This was also competing with Vocaloid concert.. but great AX coverage so far.